On my walk this morning I saw this lovely waning half moon, and remembered a conversation after our Candlemas ritual. Most people have no idea how the cycles of the moon work. We don’t learn about it in school. Years ago, when I was in my twenties, I was curious about why I saw the moon sometimes in the evening and sometimes in the morning with different degrees of light and shade. So I investigated. (This was before Google–how did I do that?) I learned that the moon follows a consistent and lovely rhythm. I talk about it in my book Finding Our Way Home. The moon is always half in light and half in darkness from the light of the sun. When the moon is full, we are seeing the whole of its light side, because the sun and moon are on opposite sides of our sky. 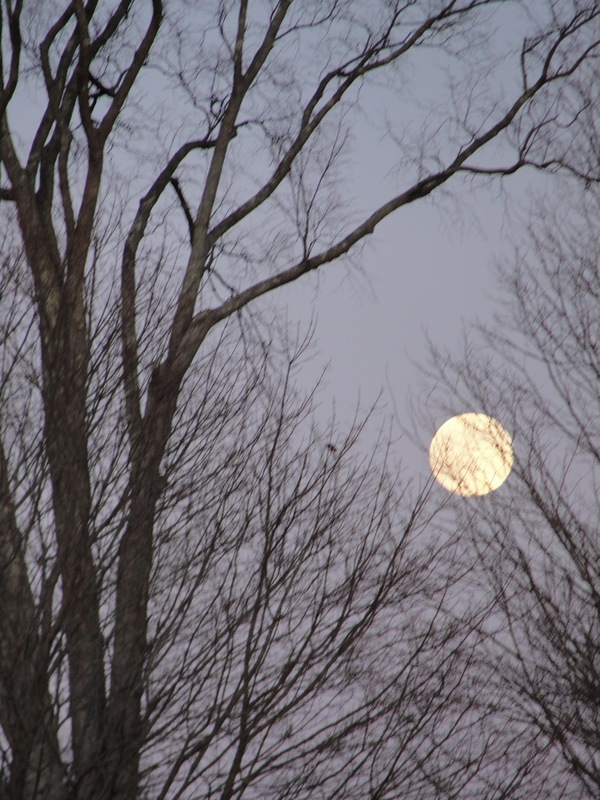 The full moon rises at sunset and stays in the sky all night, setting at sunrise. Then, as the days go by, we see less of the light of the moon and more of its shadow, and it rises about fifty minutes later each day, until there is only a waning crescent in the morning just before and after dawn. About two weeks after the full moon, the moon rises unseen with the sun and sets invisibly with the sun. The night is dark. This is called the dark moon or the new moon. Then a day or two later, a thin waxing crescent appears in the western sky just after sunset and sets soon after. Each day it is seen in the evening for a little longer time until we come round to full moon again. 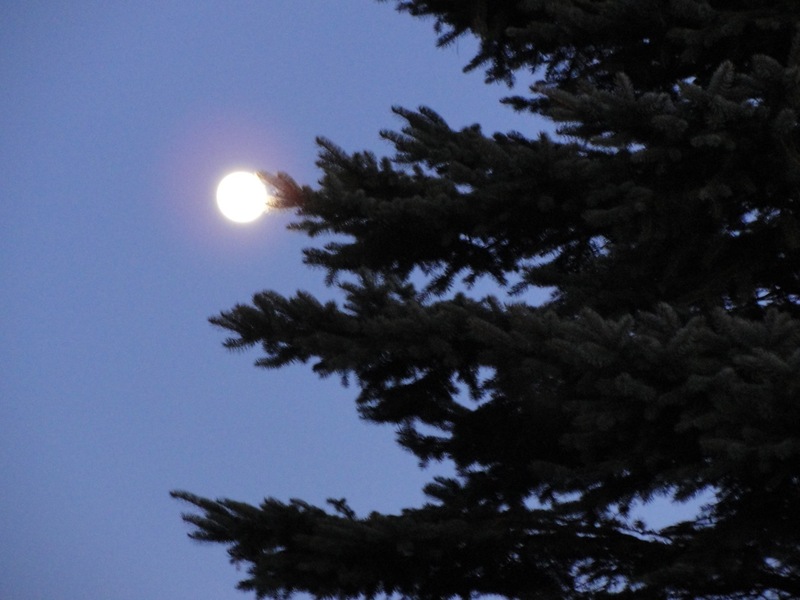 What is sad and funny to me is when fiction writers misplace the moon–for example most recently, I read a line something like this one: “I saw the waxing gibbous moon in the morning light.” The thing is, no one will ever see a waxing moon in the morning light. Waxing moons are only seen in the evening. Am I a nature snob if I want the moon to be accurately represented in fiction? The actual realities of the moon’s cycles are beautiful and magical–like a cosmic dance, which it accurately is. Here is a rather fuzzy photo of a waxing moon, taken about 8 p.m. in April several years ago. Yesterday, the movers came and lifted our boxes and furniture into trucks and over to our new house. I directed traffic at the new house. Margy and I slept here last night, exhausted and aching in every muscle, but happy to be really living here. I woke early in the morning with moonlight shining through the windows. Then I took a walk at sunrise, starting by circling the perimeter of our land from north to east to south to west–and–I heard a cardinal singing! This bird reassures me that all will be well, and offers such beauty and joy. I am so glad to know that the cardinals will be our neighbors here. On that happy note, I walked through the neighborhood over to the Evergreen Cemetery trails. After breakfast, I started unpacking boxes in the kitchen, and immediately began doing more downsizing. As I put things away into fewer drawers and cupboards than we had before, it became much clearer that some things just aren’t necessary. We didn’t have time to actually sort through most things before the move. And we didn’t actually move all of our possessions. There is still the whole basement, and outbuildings. But we have a few weeks before we have to vacate the other house, so we are doing it in two stages–and that’s a good thing. There is no way everything would fit here, and we hadn’t finished sorting in the basement. As it is, our basement here has a lot of boxes in it already. I think it will be easier to sort back at our old house, now that we are in this space. The evening before the move, we sent our cats to stay with our favorite cat-sitters. The cats have never been away from home before, but we figured it would be less traumatic to be off site while everything was being carted away. They arrived at our new home this afternoon, and are sequestered in the downstairs bathroom, with their litter boxes. They are feeling rather scared and cranky. Meanwhile, back at our other house, after $1000 of radon remediation work, the radon was tested between Wednesday and Friday, and came back WORSE than before. That certainly didn’t make any sense, and our realtor has been in touch with the company who did the work, and they are returning to the house on Monday to see what is going on. This has us rather scared and cranky because radon levels are a deal breaker for our buyers, and we don’t want to have to start over in the process of selling our house. Plus radon will likely be an issue no matter who we sell to. If anyone knows any magic or practical tips for dealing with radon, let us know. Until all of that is settled, we feel very vulnerable. It helps when I remember that our move isn’t merely a move from one house to another–it is part of our search for greener housing, and that change is more difficult than we might expect. Our whole social system is currently set up to exploit the earth. Margy and I have been really lucky to be able to undertake this search, and yet it still depends on our being able to sell our old house at a decent price, so we can afford solar panels for our new house. But, I remember that we are among hundreds (thousands?) of people who are trying through our personal actions to live in greater harmony with the earth. Each step is a part of the great shift in the human relationship with with our mother earth. Beings of the earth, help us on this journey! I started to write a journal when I was a young adult. It was 1979, and I was a year into my first serious relationship with a partner. His name was Gary, and we were deeply in love. But the first pages of an orange spiral notebook are filled with my confusion and pain about the struggles in our relationship. When things were difficult, he withdrew from me, and so I wrote about the pain I felt when he withdrew. I wrote about who we were together, and parts of myself that seemed to be disappearing. Perhaps I should thank him now—if he were a better listener, maybe I wouldn’t have started writing so much. But once I started, writing became an important way of learning about myself, a spiritual practice that has continued to this day. I wrote my questions about how to live in the world, what my own calling might be, what brought me joy and what left me empty. I wrote my questions about God. It was in that same year, 1979, that I was wrestling with big questions of spirit and faith. I was introduced to the idea of the Goddess, and women’s spiritual circles. I wrote to God, to Goddess, to Jesus, all my questions and doubts, in a kind of prayer—are you real? Are you there for me? What am I meant to do in this life? Writing can unburden our hearts and minds. We can take our weary feelings, our anger, our confusion, our loneliness, and we can put it outside of us, setting it down on paper. It can help us to let go, and move on. Writing can also take us more deeply into our own hearts and minds, and open us, layer upon layer, until we reach the place of inner wisdom. 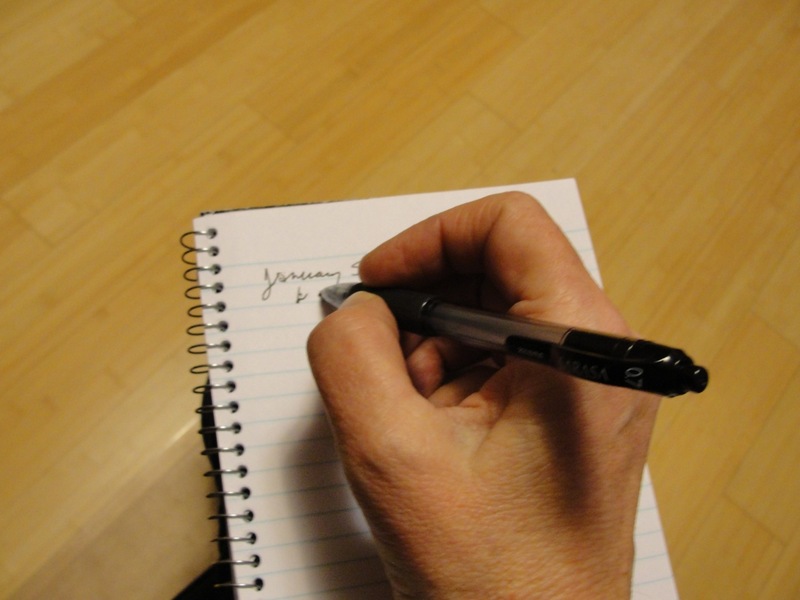 Polly Berends said, “Everything that happens to you is your teacher…the secret is to learn to sit at the feet of your own life and be taught by it.” Journaling is a way of sitting at the feet of our own life and being taught by it. A few years into my journaling, I began to mark the pages according to the cycles of the moon. Each new moon, I began to read back to the last new moon, and sometimes I would give a theme to that moon time, like a chapter to a book: the traveling moon, the moon of discernment, the moon of confusion. To read through our own journal entries is another way of being taught by our lives. One summer, I was sitting at our campsite at Winslow Park, watching the sun rise over the water. It was a day without a lot of plans, so I could sit and watch the sky and water for a long time. I noticed how fast the sun seemed to move up the sky. I heard somewhere that you can estimate the time by holding up your fist sideways, and counting each fist width from the horizon to the sun as an hour. In a simpler world, it was enough to tell time by noticing where the sun was in the sky. Curious about this, I discovered that actually, if you took a picture of the sun at noon every day for a year, you’d find that it wasn’t in the same spot at all. Rather, you’d have a photo of an elliptical shape, like a lopsided figure eight. People call this path of the sun an analemma. It is formed from the fact that our orbit is not an exact circle, but an ellipse, and our planet is tilted relative to its orbit around the sun. So we have the seasons, and each day from June to December the sun rises a few minutes later, and a little bit further to the south, passing by due east on Equinox. The natural world is full of these movements that follow their own intricate rhythms and orderly patterns. As I become aware of them, I begin to feel myself as a part of a vast dance with the sun, the earth, the moon, the stars. Our spiritual journey is such a dance—it too follows intricate rhythms and mysterious patterns. We may imagine that we are going forward, but perhaps we are dancing round and round like the moon. Each day, the moon rises on average fifty minutes later than the previous day, and the high and low tides are changing at a similar pace. 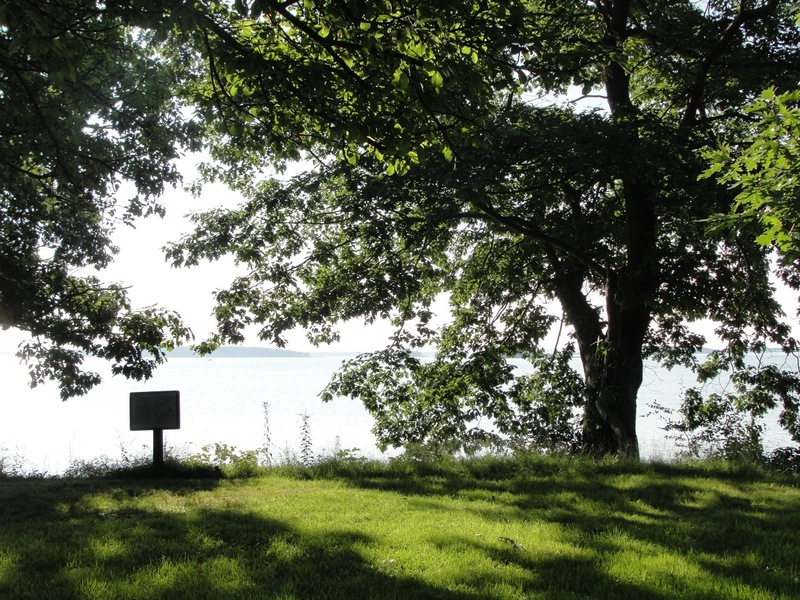 Winslow Park has a tidal beach, so we pay attention to the tides in the summer. You can only swim for about two hours before and after the high tide. One of our city friends didn’t understand about tides. We were planning to go swimming with her on a Wednesday. Two days before, she was visiting the beach and called us from there to make plans. “The sign at the beach house says high tide is at 2 p.m.,” she said, “Shall we meet at 2 on Wednesday?” We had to explain to her that the tide would be later in two days, closer to 3:40 p.m.; that it changes every day. Once, years ago, I created a moon calendar for my stepdaughter Stephanie, who was six years old at the time. I was curious myself about why the moon was sometimes seen in the morning, and sometimes in the evening, and I thought it would be fun to learn about it and share it with her. So I tracked it, and began to understand its pattern. The full moon rises at sunset and stays in the sky all night, setting at sunrise. Then, as the days go by, the moon begins to grow smaller, and it rises about fifty minutes later each day, until you can only see it in the morning just before and after dawn. About two weeks after the full moon, the moon rises unseen with the sun and sets invisibly with the sun. The night is dark. This is called the dark moon or the new moon. Then a day or two later, a thin waxing crescent appears in the western sky just after sunset and sets soon after. Each day it is seen in the evening for a little longer time until we come round to full moon again. I want to call us to a deeper appreciation of truth—that we not be attached to any ideology in a way that becomes a kind of idolatry of the mind. Words and ideas about spirituality are not meant to be literal. They are like the finger pointing to the moon. If we spend a lot of energy debating the nature of the finger—what good will that do for us? If we defend the finger, or try to ridicule the finger, or argue about the finger—we’re missing the point. The point is that the finger is pointing to the moon. I hope that we might learn to shift our gaze, and discover that beauty and mystery!